Goal: Use RFC-2544 as a guide to create an Armageddon connection that can run automatically through various payload sizes and rates for a specified duration. 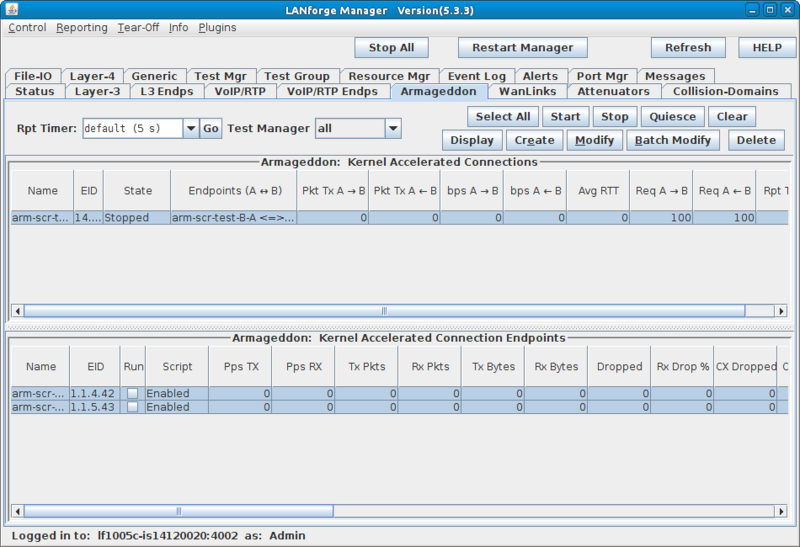 In this example, LANforge is used to set up a scripted connection that will iterate through a user-defined list of payload sizes and transmission rates. Each iteration will run for a user-defined duration with a user-defined pause between iterations. 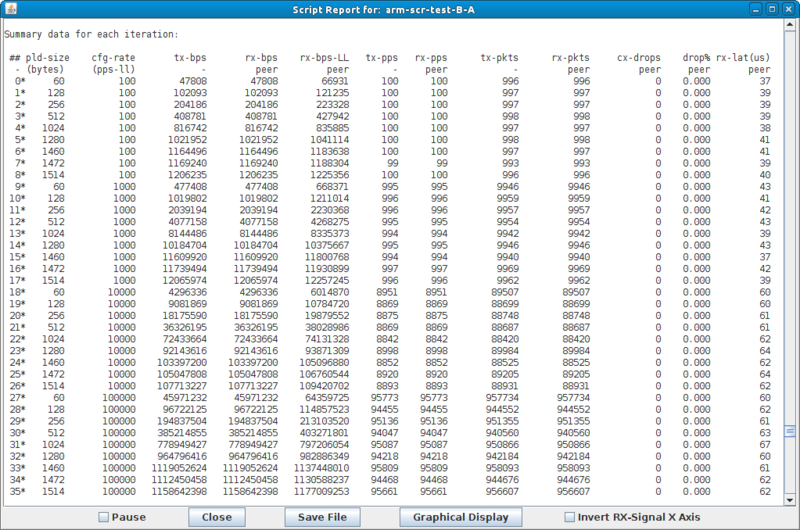 A summary text report is generated at the conclusion of all iterations. Modify the Armageddon connection to add the script. Highlight the Armageddon connection and select Modify. 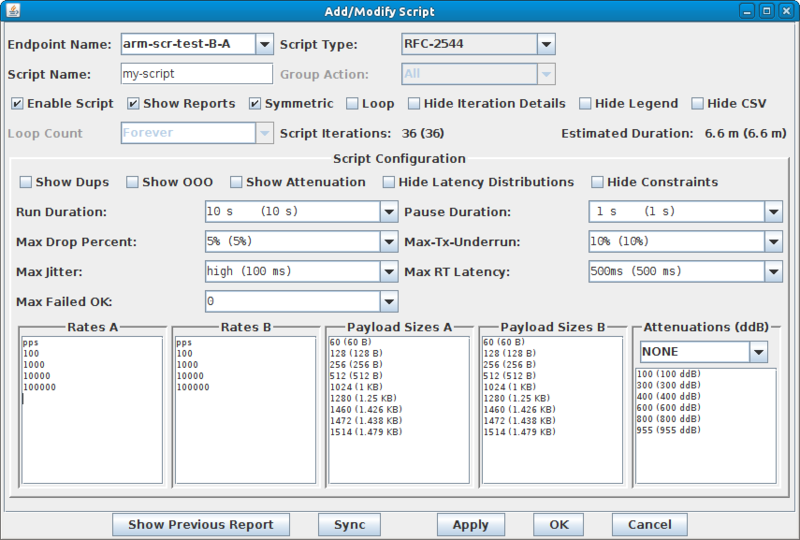 Select the Script button on Endpoint A. Select the Script Type 'RFC-2544'. Note: A default set of payload sizes are set up based on RFC-2544 but, can be changed by typing over the default values. Note: For Armageddon UDP connections, 'payload size' refers to the ethernet frame size. Select Symmetric for the script to run both endpoints for a bi-directional traffic test. 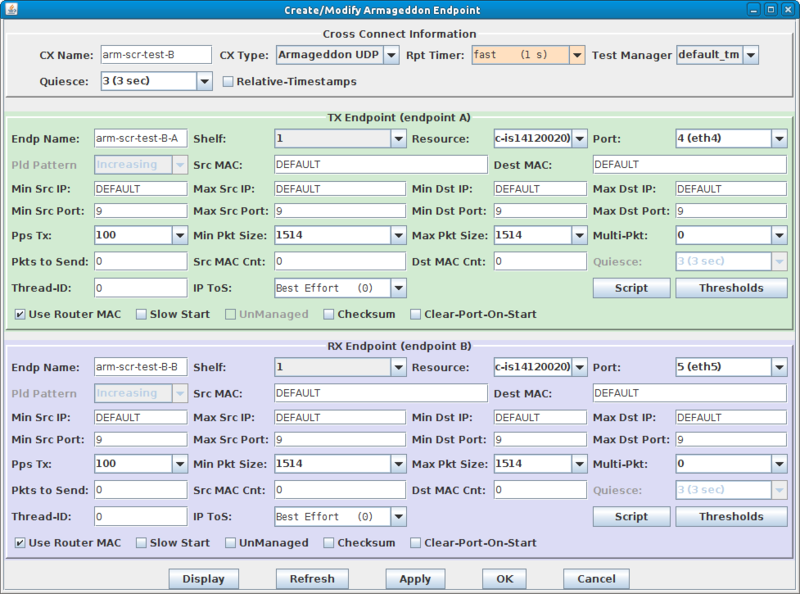 Set the Run and Pause Duration, max failure thresholds, and modify Rates and Payload Sizes as needed. Note the total number of Script Iterations and Estimated Total Duration to help determine how long it will take to run this script. Select OK to close the Add/Modify Script window. 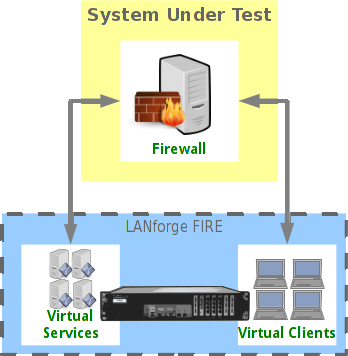 The Script Type for Endpoint B is set to NONE because Endpoint A is controlling both ends of the connection in this symmetric script example. Select OK to close the Create/Modify Cross Connect window. Start the Scripted Armageddon Cross Connect. Highlight the Armageddon connection and select Start. 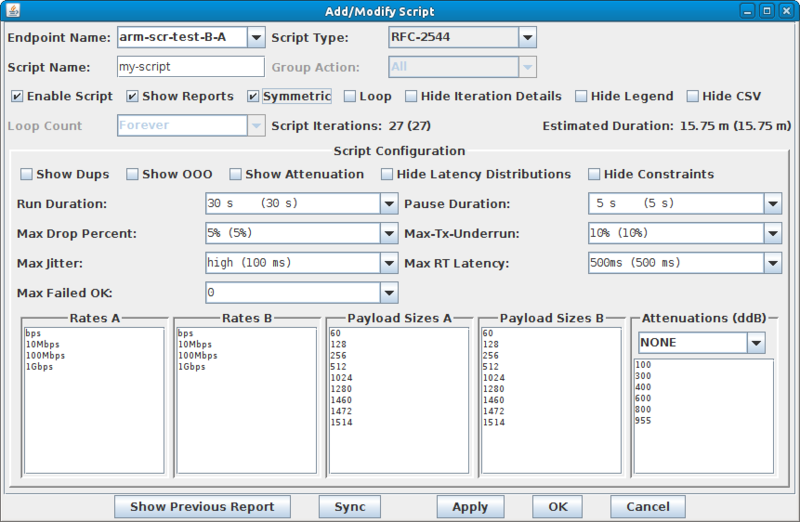 A script report window will pop up and show the details of each iteration of the scripted connection as it is run. 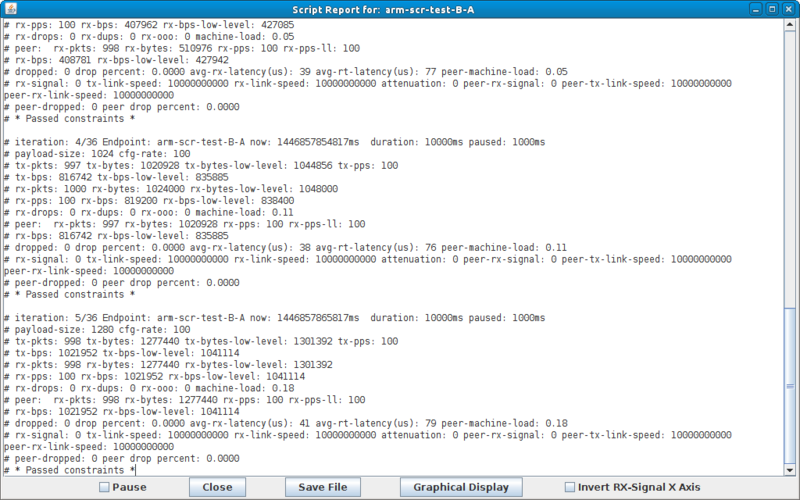 At the conclusion of the script, the report window will display a summary of the entire scripted connection results. For more information see Full Script Report for this example.